Nintendo of America president Reggie Fils-Aime says Nintendo conferences aren't "dead." 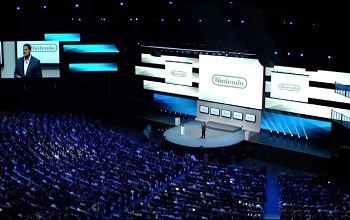 Nintendo made an arguably bold move this year, forgoing its traditional E3 press conference and instead offering smaller presentations and reveals via other avenues. It was an understandable move in many ways. E3 press conferences aren't on the cheaper end of the shindig scale and recent years have seen several of Nintendo's conference offerings fall flat among critics and viewers. All of this said, Nintendo might not be ready to fully quit the conference game just yet. According to Nintendo of America president Reggie Fils-Aime, the future could hold future press conferences from Nintendo. "Next year and what we do at E3 next year is going to be an ongoing conversation," said Fils-Aime. "What we are not saying as a result of this year is that the Nintendo press conference is dead." According to Fils-Aime, this year's decision to skip E3 was a result of Nintendo's software lineup and increasing use of Nintendo Direct. "Nintendo Direct is very powerful for us and we are going to continue to utilize Nintendo Direct to drive engagement with our user." The prospect of future Nintendo press conferences is likely to excite some, especially those who enjoy the more competitive "who won" aspects of E3. That said, if there are more effective methods the company can use to get its message out year round, it begs the question of why it would bother returning to traditional press conferences in the future.